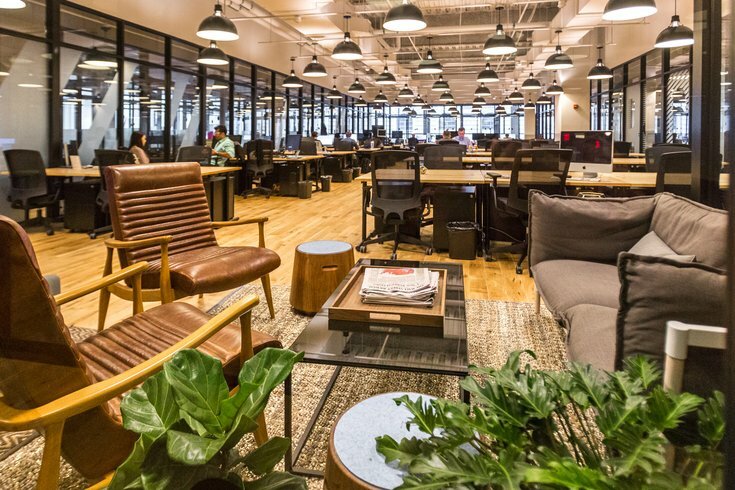 The main workroom at the WeWork co-working office space at 1430 Walnut St.
Coworking has taken off in Philadelphia – especially in Center City and University City – which is only proper. The man who coined the term, Bernie DeKoven, is grounded in the Philadelphia area. He lived in Camden after high school, went to college at Temple and Villanova universities, and taught in both Delaware County and Philadelphia. Of course when DeKoven, 75, first used the phrase in 1999, coworking was an idea, not a place. Today, it is a phenomenon: There are now about 8,000 physical coworking spaces around the globe. In 2005, there was one. That’s crazy growth since the first official “coworking space’ opened in San Francisco in 1985. DeKoven said he had no inkling his idea would become this. "Not the least, not the slightest," he says. But a giant it now is, with the largest player in the world, WeWork, now in Philadelphia and already looking to expand. Just a six-year-old company, WeWork is already a behemoth. Investors have placed a $16 billion valuation on the young company, which has 100 locations in about 30 cities in 12 countries. About 80,000 people work out of their spaces. The company joins about a dozen other coworking spots in the city. The largest is regional leader Benjamin’s Desk, with multiple locations in Center City, as well as a location in Ambler and nearby Wilmington. But there have been casualties already in the city's emerging shared office space market. The Hive, a location specifically for women in Old City, the Impact Hub in Kensington and non-profit Seed Philly, more of a startup incubator space, have all closed recently. Still, there’s been a staggering amount of growth for what was just a term coined only 17 years ago. But then the concept of shared work space really isn’t anything new. Craft guilds may be the earliest example of coworking, with some begun in medieval times. Essentially a collection of craftsmen with specific skills, guilds turned out such durable goods as armor, swords and eventually guns, one small step at a time through collaborations of craftsmen. One man fashioned the stock, another the action, another the barrels, and so on. Together, they made a living from the finished product. But that approach meant large scale production was impossible. Modern manufacturing, coupled with the spreading demand for more affordable alternatives, largely killed guilds. And knowledge-based work collaborations are also nothing new. Professional associations – think the legal profession’s American Bar Association, founded in 1878 – are one example. But members of professional associations don’t generally physically work together in a shared spaces. Instead they meet, they discuss, they set standards – then go their separate ways. But collaboration – sometimes face-to-face, sometimes virtually, most often some of each – is in vogue in the knowledge-based economy because computers have radically changed how we think about – and accomplish – work. Enter DeKoven, with a master's degree in theater from Villanova who left teaching and became a computer game innovator and designer. The move toward coworking began with his use of a computer tool called the "Outline Processor" to organize his design of games, keep working on them and share them with others. DeKoven soon realized he could apply a similar concept to meetings for executives and teams and he created IBM, which is a purposeful bit of wordplay: IBM means the Institute for Better Meetings in DeKoven's world, which values playfulness. He realized even the least formal meetings tended to become threatening and destructive with leaders with hidden agendas who would not let go. "It depressed me," he recalled. He also realized many meetings were not productive and quickly became boring. That was especially so after the creation of PowerPoint, in 1990, he added. DeKoven's solution to bad meetings was going to see clients as a facilitator for brainstorming and strategic planning sessions, something of a traveling roadshow version of coworking with DeKoven as a facilitator, not a company executive. The meetings he facilitated collected ideas and information, connected the information and then went back and corrected the information to produce a workable plan. "Meetings work best when we collaborate without competing. What I learned is it is easier to change the game than to change the players," DeKoven explained. "Coworking means making your own rules and seeking an environment to do that. At the heart of this is the hope of independent people who want to be in a place to pursue their interest in community," he added. "I learned that by pure accident." The second floor and lofted lounge areas, kitchen, welcome desk and mini market at the We Work coworking office space, 1430 Walnut St.
DeKoven printed two booklets on the subject and created the first coworking website, but he admits he never imagined the permanent coworking space. But he likes that the idea is flexible enough that anyone can adapt their work to some aspect of coworking. "It appeals to nomads who now feel like they have a home for their brilliant idea, but would like to see that brilliant idea extended by working with others," he added. Transforming his ideas into widespread action took time to take off. • the desire of large established companies with suburban campuses to have a meeting and work space within the urban core. The ability to customize a workspace has driven its popularity, as well, from a daily desk rental to larger offices, with flexible rental agreements that allow space to increase or be trimmed, and relatively short notice for rental agreements. Many of the coworking spaces emphasize programs and events meant to foster a sense of community. Dave McLaughlin, WeWork’s general manager for the Eastern United States and Canada, a former software company owner, saw firsthand another key reason behind the demand when he was running his own startup: The price of coworking space is lower than traditional commercial office space. “It was eye-opening. That’s because of unbundling costs, and plugging into the shared value, like you do with cloud computing,” said McLaughlin. Coworking allows companies “to plug in seamlessly” he said. And it’s especially appealing to “millennials, creatives, programmers and engineers” of the “knowledge-based economy,” though WeWork also rents space to a brewer in one location, he added. While not sharing specifics, McLaughlin said his company is “super bullish on Philly” and expects to expand its footprint here. 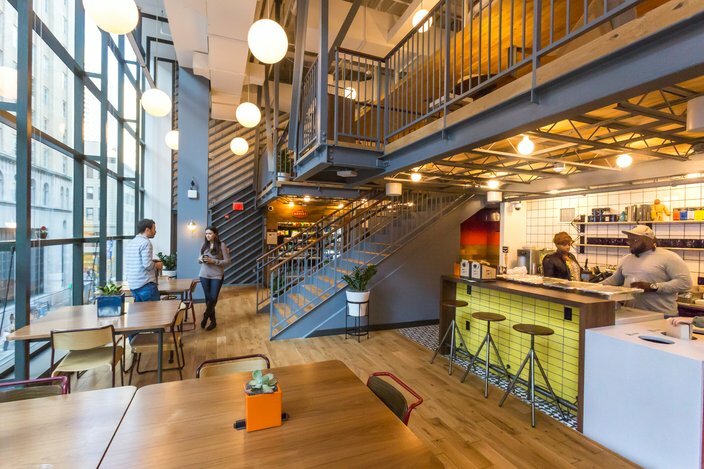 Given the base of millennials stuffed into Center City and University City, it’s easy to see why WeWork is still eyeing growth here. Millennials now make up 26 percent of the city and the most prevalent age group is 25 to 29. Part of WeWorks' word-of-mouth promotion – many members have done work together and the company fills lots of its space through referrals – is a program called Mission Possible, which provides free, short-term startup space to companies which pledge to give back. One such company in Center City is Lindigua, which specializes in bilingual and bicultural approaches to reaching the Hispanic market. Lindigua founder Brittany Magnin explained the benefits: "Everyone wants to see each other succeed and is willing to help out however they can, providing critical and valuable feedback or introducing you to one of their relevant connections." “And the energy of the physical location breeds hard work and creativity," she said. Kevin Kreider, who grew weary of working out of his home and didn't find crashing the wi-fi at a coffee shop a good fit for his online fitness company, has increased his business, Pursuefit, by 40 percent since taking space at WeWorks. He says he's already done collaborations with others in the building and he likes having space that is "warm, comfy and cozy" for the two seminars he's already held at WeWorks. Professor Richardson Dilworth, director of Drexel University’s Center for Public Policy and the grandson of Philadelphia’s legendary mayor of the same name, said demand and opportunity in a changed economy that has made a “massive shift” into information technology is behind the demand for coworking space. Dilworth, who has written about commercial corridors and incubators for the Federal Reserve Bank of Philadelphia, said the cheaper cost of coworking space which still provides a professional atmosphere is a deciding factor in choosing coworking over a traditional office. Dilworth said the demand for Center City housing a few years ago was driven by empty-nesters, but now the demand is largely “the very young and the super affluent,” he said. None of the commercial office space Realtors contacted by PhillyVoice responded to a request for comment about how coworking has impacted their business. The professor sees demand for coworking space growing especially near educational and medical centers. “Coworking is a formalization of things that have always existed, such as with lawyers and brokers. It is not new, but it is another level,” Dilworth said.